Nicole and Trish are EMU alumnae, sorority sisters, best friends, and fashion entrepreneurs. 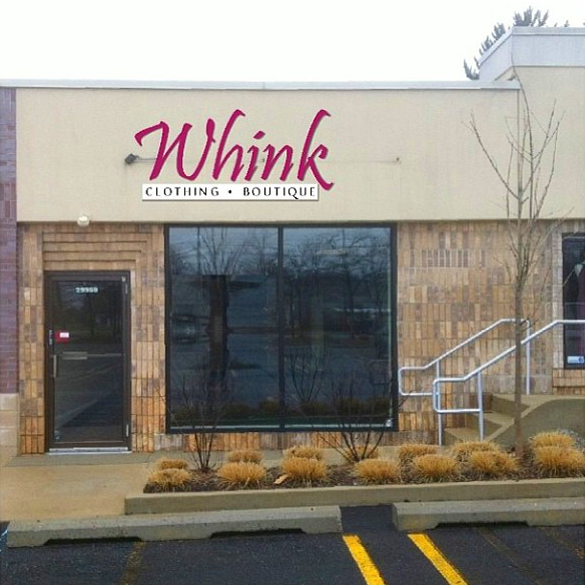 They recently opened the doors to their Southfield-based clothing store, Whink Clothing Boutique. Nicole and Trish have known each other for 15 years. In 1998, both girls were attending Eastern Michigan University, and both girls decided to join the Delta Sigma Theta Sorority. Though working toward different majors, Trish and Nicole had one passion in common: fashion. Little did they know, in the future, this shared interest would be the focus of an exciting joint venture. While studying at EMU, Trish and Nicole were highly involved in Campus Fashion shows. They worked collaboratively to select models, garner clothing donations from local businesses, and approve outfits. During their involvement in Greek Life, community service became a top priority for them as well. Trish finished her undergrad in 2000, and then went to grad school. Nicole earned a bachelor’s degree in 2002. It would not be until several years later that these two would choose to start a business together. The store is located at 29959 Northwestern Highway in Southﬁeld, Michigan. June 14 at 4:00 p.m. marked the grand opening event for Nicole and Trish. 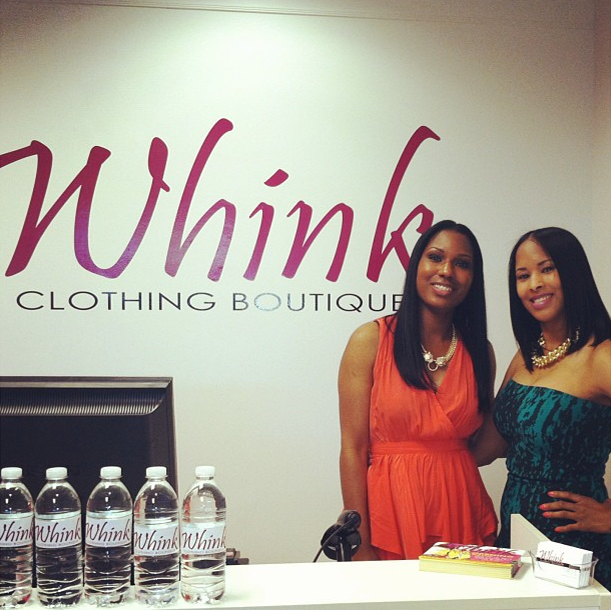 Together, they hosted the Whink Clothing Boutique ribbon cutting ceremony. Southfield’s mayor attended, as well as new customers, and local media. The day was a success, and featured hors d’oeuvres, giveaways, and of course, fashion. Trish and Nicole donated a portion of all proceeds raised at the ribbon cutting ceremony to Girls with Gifts, Inc. Girls with Gifts is a bi-coastal mentoring organization “inspired to inspire” young girls, ages 11-18, with aspirations in the arts and entertainment. If you would like to get “Whinked”, be sure to the store located in Southfield, Michigan. “I like to play a little golf these days,” says Danny Schmitz. As time goes on, Danny likes to focus more and more on his wife, kids, and two dogs. 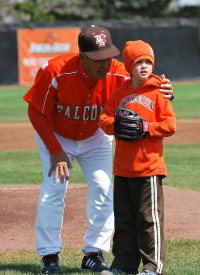 However, his day job, as Head Coach of the Bowling Green Falcons baseball team, keeps him quite busy. Luckily for Danny, he is doing what he loves and is quite good at it. Under his guidance, the Falcons have won five regular-season conference championships, earned six MAC titles and much more. How does the most successful coach in Bowling Green history do it? Danny attributes his accomplishments to his excellent staff, family and experience. Eastern Michigan University was a large part of that experience, and he is a proud Alumnus of EMU to this day. Danny was a talented and passionate baseball player from an early age. By the time he was in high school, he was being considered by a number of universities. 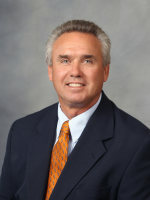 EMU, Western, and Central were all in communication with him regarding their baseball programs. “The bottom line is when I met the coaches from EMU, I knew without doubt it was the place for me,” says Danny. Danny Schmitz quickly made a name for himself in EMU athletics. He played from 1974-1977, during this time EMU won two MAC titles, and was ranked third in the final Collegiate Baseball poll. He says, “I tell you those are four years I will take to the grave with me… I met some very special friends. I can’t say everyday was a rose garden, but it was great to have outstanding coaches and teammates.” Danny was also gathering coaching philosophy that he would later integrate into the way he develops his players at BGSU. After 1977, he was drafted by the New York Yankees, and began the next phase of his baseball career. He played there for six years. Danny’s career would continue to evolve and change, always centering on baseball. The game took him to Korea and Taiwan. He would even play for the Mets and the Twins, and earn a World Series Ring. Eventually, the Hazel Park, MI native would return home to EMU as a coach. From 1987-1990, Danny helped the EMU baseball program grow. One day, a position with Bowling Green State University opened up, and Danny decided to make the move. “Coach Oestrike made a call for me and got my foot in the door. Here we are 23 years later… It has been a wonderful experience.” says Danny. The future looks bright for Danny and the Bowling Green Falcons, their success is projected to continue. A life in the game, a wide set of experience, and a staff for which he is deeply grateful allows Danny to still have passion and some to spare for baseball. Unlike many business start-ups, DROUGHT is experiencing large amounts of success, and is projected to continue to grow. This feat has been accomplished by one family with five sisters, (two of them are EMU alumni) a common goal, and some really great juice. Caitlin graduated from Eastern Michigan University in 2007 with a degree in special education. She enjoyed EMU because attending class in Ypsilanti allowed her to still live at home with her close-knit family in Plymouth. “It was easy for me to pick special education once I got there…I wanted to do something that was helpful and meaningful to others. Also Jane (a James sister) took it, and she is someone I really look up to.” While working in the Special Education program, Caitlin had an experience which would lead to the DROUGHT concept. Two years later, she came home and decided to go back to school in New York. However, that plan would not work out because Caitlin and the rest of the James sisters were all thinking of something else. They wanted to start a business, and they wanted to promote health. “I can never explain it and not make it sound too simple. We were all on the same page…We were going to have a stand at the farmer’s market and sell juice. In just a matter of days that plan started to evolve,” said Caitlin. And this is how DROUGHT was conceived, a family of educated sisters, all putting their minds together. Before long, Caitlin and her sisters realized their idea was now much larger than a stand at a market. They needed a formal business plan, and they needed funding. The sisters turned to Kickstarter, a web site for individuals to make small investments toward start-ups. The Kickstarter community loved the Drought concept so much, in one month the girls raised $13,000. DROUGHT juice comes in a variety of awesome flavors! Today, Caitlin runs DROUGHT with her sisters, and business is expanding steadily. In a year’s time, they have gone from two employees to seven, and are now selling in Detroit’s Eastern Market, Plum Market in Ann Arbor, their storefront in Plymouth, and Detroit is coming this June. Caitlin’s experiences have taken her from Plymouth to Ypsilanti, across the Middle East, to New York, and then back to Metro Detroit. Every new task and location has added to whom she is today. 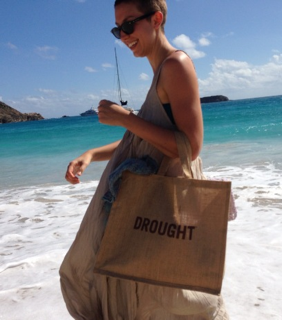 EMU is proud to be part of DROUGHT’s inception and to have provided Caitlin with practical skills and experience she still uses. Caitlin James has been featured in Crain’s Detroit Business “Twenty in their 20s” which celebrates highly successful individuals in their twenties. She was also invited to sit on the Entrepreneur Panel in the 2013 Mackinac Policy Conference. “Promote yourself.” That’s what Taylor Maguire says; and the confidence with which she endorses her abilities led the perfect job to her, not the other way around. Taylor Maguire has two degrees, in two of her passions. 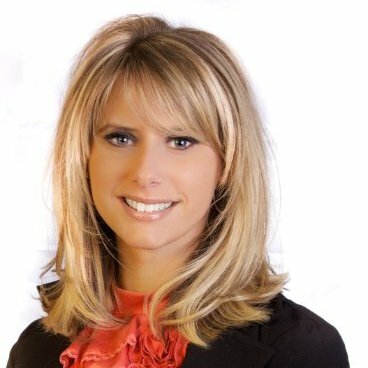 She holds a bachelor’s degree in public relations from Eastern Michigan University, as well as a degree in photographic technology from Washtenaw Community College. Taylor is also working hard in a fantastic job which utilizes both her specialties, and seems to have come to her. How does she do it? Too often, students find themselves attempting to match what they like to do with an incompatible, profitable career choice. However, Taylor shows us the key to success is to make your career choice compatible with what is most enjoyable. Taylor came to Eastern Michigan University in 2011. She was filled with ambition, but was unsure about which path to take. “I was in a limbo state, I honestly considered marketing, public relations, and occupational therapy,” she said. At the same time, she came to EMU a junior, and felt, “I never got the typical freshman experience.” However, things were going to come together very nicely for Taylor. A conversation with a friend led her to try an introductory class in what would become her profession. “I was telling my friend I see myself working events, writing, and dealing with the press,” said Taylor. Hearing this, Taylor’s friend encouraged her to take JRNL 312: Intro to PR with Professor Regina “Gina” Luttrell. That was all Taylor needed. Taylor quickly declared public relations as her major, took a full load of classes, joined the Public Relations Student Society of America (PRSSA), and finally ran and was elected Vice President of Special Events and Coordination within the student organization. Taylor had become close with Professor Gina, and joined PRSSA based on both her and good friend Marietta Ford’s (’11 grad) recommendation to do so. Taylor was getting better. With each new challenge she took on, she became a more experienced public relations specialist. Taylor had her classes mapped out, a respectable role in a student-professional organization, and now all she needed was an internship. Taylor had a few interviews with PR internships in surrounding communities, and was considering them all when she received an email promoting a possible internship opportunity in EMU’s Office for Alumni Relations. Interim Executive Director of Alumni Relations Daniel Mathis was looking for a PR Intern to help promote alumni chapters, and help with events. Taylor sent in her resume, and shortly after interviewed and was hired. “Dan and I really hit it off. After meeting Dan I was really motivated to get this internship because of how professional and friendly he was,” said Taylor. Then Taylor received an email which seemed “too good to be true.” The CEO of MiRealSource was looking to hire someone very specific. MiRealSource is “Michigan’s largest real estate multi-list source and provider of real estate resources, tools, and training for real estate professionals,” and the organization was in need of a person skilled in both public relations and photography. He had contacted local PRSSA chapters and thus, discovered Taylor. He offered her a position, and Taylor spoke it over with Gina. She accepted. 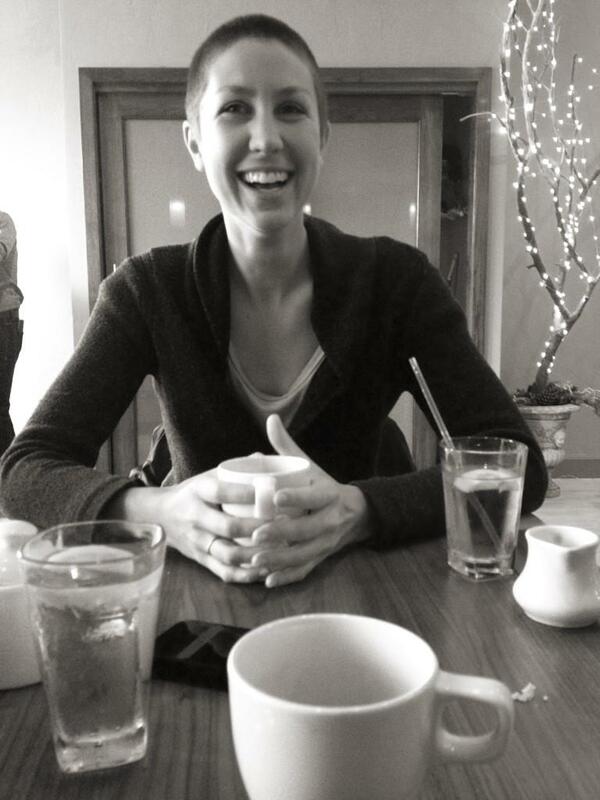 Today, Taylor works for MiRealSource as a Communication and Photo specialist. She uses her extensive training and experience in Public Relations work to run social media, internal and external communication. She also uses her photography skills in teaching “Photos with Taylor”, a class in which she instructs real estate agents on how to properly shoot home/landscape pictures for listings. She also runs her very own photography business: Taylor Leigh Photography! Taylor looks back on her time at EMU with pride. “I really learned how to juggle a lot of different projects. I recommend that you get as involved as you can… Put yourself out there; make sure your personality shines through. Promote yourself the best you can.” Taylor came to EMU as one student who was willing to try new things. Because of this mentality, she was able to accrue a set of experiences which she may have never gotten otherwise. Taylor says, “What I do now is what I like to do.” With hard work and an open mind, the success Taylor has is attainable for all graduates. All of us in the Office for Alumni Relations are extremely proud of what Taylor has accomplished, and look forward to seeing what her future successes look like! Want to keep up with Taylor, or check out her work? the intern Taylor chose as her replacement. 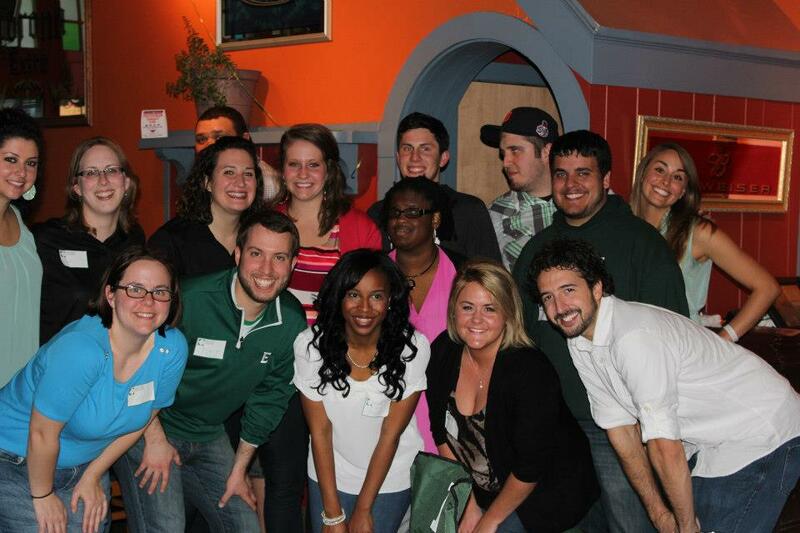 On Friday, April 26, 2013 the EMU Young Alumni Council hosted their annual April “New Alumni Happy Hour” formerly known as the “Graduation Celebration”. The event was held at the Tap Room from 7:00-9:00 pm. The happy hour hosted over 60 attendees including recent graduates, young alumni and their family and friends. 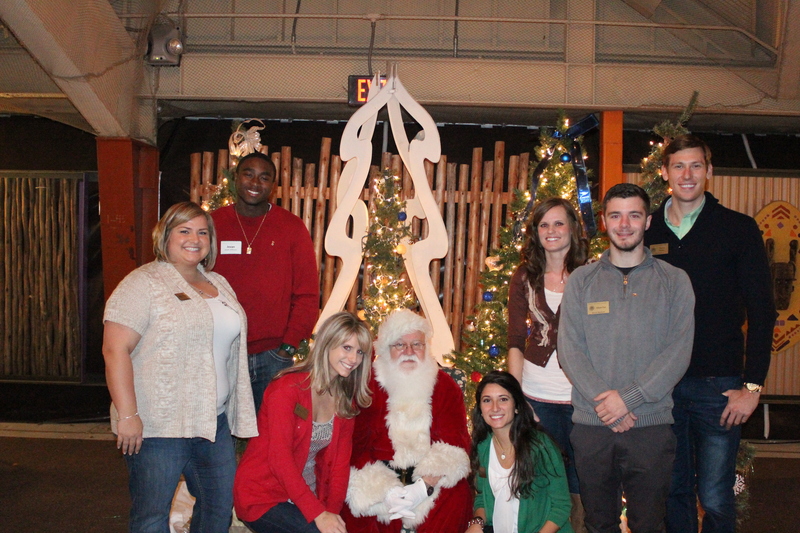 Members of Young Alumni Council and Alumni Association board were in attendance as well. There was a delicious buffet which included pizza, a nacho bar, and homemade potato chips, and of course, drinks specials! Many of the guests won door prizes. 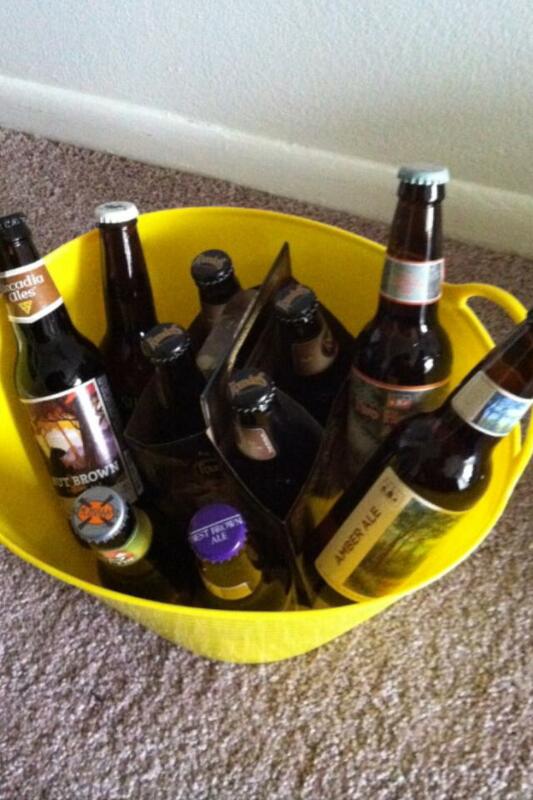 The top winners walked away with a gift basket of all Michigan brewed beers and a basket of Michigan made snacks! Everyone had a great time talking and eating and we are looking forward to the next “New Alumni Happy Hour” in December. The Young Alumni Council’s next event is at the Lansing Lugnuts game on August, 24, 2013 with a pre-tailgate party. Stay tuned for event details. Just three days ago, two and a half thousand men and women joined the Young Alumni ranks. It’s a staggering number; one which has made EMU history as the largest graduating class ever. EMU now boasts over 148,000 alumni. I had the privilege of being a part of that class. The ceremony ran smoothly. Keynote speaker, Scott Reynolds, executive story editor for “Dexter“, was outstanding, and the feeling of commencing the rest of my life was surreal. However, what is still with me days later is the message Student Government President, Matthew Norfleet delivered to the soon-to-be alumni. Matthew himself was graduating, and reminded us of the people in our lives who have made our successes possible. For Matthew, it was his mother. For you, that person or persons could be anyone. I am fortunate to have an entire network of support in my friends, professors, loved ones, and especially my parents. Sincerest congratulations to the 2,376 former students who graduated last Sunday, you are the pride of Eastern Michigan University. We now have a chance to stay connected, and become the support of future graduates by getting involved. So please keep in touch, and let us know where life takes you. Be sure to get your free Alumni Association Membership Packet! Best Wishes in all your endeavors, and again congratulations! If you were to read the blurb on the back-cover of Zug Island: A Detroit Riot Novel, you would learn that it takes place in the Motor City during the late 60s, and tells the story of Jake Malone. Jake is a young, white, suburbanite who finds himself working in the dank recesses of Detroit’s Zug Island. How does he get here? Well, Jake is kicked out of University and needs to find work. This singular alteration in Jake’s path sends him on a journey he is unprepared for. His journey will be filled with danger, racism, violence, and a healthy portion of humor. What you would not learn from the back-cover plot synopsis is that Jake Malone is Greg Fournier; at least for the most part. Greg Fournier is a 1977 graduate of Eastern Michigan University. He earned both a Bachelor of Applied Science in English Language and Literature, as well as a Master of Arts in World Literature. Greg was not always so studious. It was only Greg’s first year at EMU when he was “thrown out of Best Hall for drinking.” According to Greg, he was then dismissed for one semester, and had to find work. Greg needed money. This is how he came to work at Zug Island, a place he would call, “the dirtiest, coldest hell-hole.” Work at Zug Island was grueling, physical labor, and racial tension added to the stresses of Greg’s employment. Then the Detroit Riots broke out. According to Greg, this harsh time in Detroit’s history would provide him a, “crash-course in race relations, and really start my life as an adult.” Zug Island introduced Greg to his first, real African American friend and provided him the inspiration and basis for his first award winning novel. After enduring Zug Island, Greg returned to EMU with a new-found passion for education and adherence to rules. Greg says, “It was just amazing how much my grades improved when I got back to Eastern.” He quickly earned his first degree and began teaching English at Ypsilanti High School while working toward a Master’s. Throughout Greg’s teaching career, he worked in Ypsilanti and eventually moved to San Diego, California (where he currently lives). He even spent a year teaching English at EMU. During these years, Greg would write. He wrote short stories, poems, text books, and stage plays. Then Greg decided, “I am never going to teach summer school again,” and used his summers to compose something else. He began to write about his experience at Zug Island. He was writing his own story. He wrote about his first car, about school, and about his first African American friend who would, “open up a whole urban world” for Greg. It all seemed to flow, and Greg knew he was writing a novel. Greg retired from teaching and focused all his effort into writing the story about Jake Malone, and he wrote it well. Zug Island: A Detroit City Riot Novel is a 2011 Best Books Award Finalist, and received an honorable mention at the Los Angeles Book Festival. It has received overwhelmingly positive reviews, and provides a no-nonsense perspective on the harshest event in Detroit’s history. For Greg, the real value of the book lies in the exposure it has brought him. “This is a blue collar book full of the words which made Detroit famous. The real value is in the doors it has opened. You can’t just enter this profession and be successful; you have to build an audience.” Greg now has an audience; he also has another story to tell. Greg is now working to write The Rainy Day Murders, a historical story set in Washtenaw County. Greg had just returned to EMU from Zug Island, and was residing in South campus when he found out he was living one block from a serial killer. John Collins was convicted in 1969 of murder. The jury found Collins guilty of one of the seven killings he was accused of. Greg is convinced he is responsible for more than has been reported, and his next work will lay out the evidence. Greg says, “I discovered John Collins was a suspect as I was walking back from the Corner Grill. I was walking past his place; it was full of police cars, and they were collecting evidence from the garage and his room.” He was immediately fascinated by the case. Greg had personally encountered Collins on four occasions, and says they were all negative. Greg Fournier has a compilation of experiences which tell a dramatic, raw story, and he is writing it all. He has an audience and a story, where it will lead him remains to be seen. 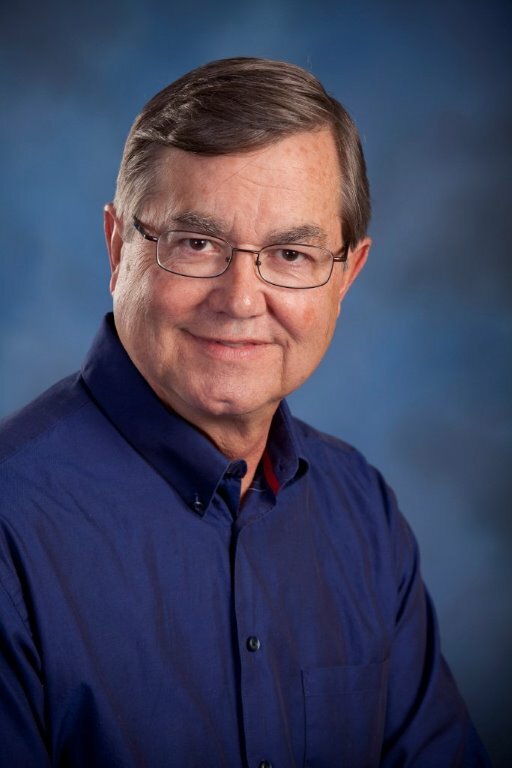 If you would like to connect with Greg, or learn more about Zug Island or The Rainy Day Murders check out his BLOG HERE.